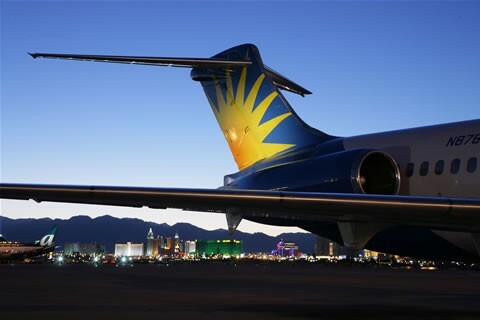 AirTran out, Allegiant in. That’s a quick summary of a change in air service to Central Illinois Regional Airport, also known as Bloomington-Normal. AirTran formerly flew between Bloomington and Florida, and after AirTran announced it would stop serving Bloomington, Allegiant quickly moved to fill the void. Starting May 16, the small-market leisure specialist will fly two weekly round-trips between Bloomington and Orlando/Sanford, with introductory fares starting at $74.99 each way. Allegiant’s business model has improved air service to lots of places around the country: Fly less-than-daily service linking small cities with such key visitor destinations as Orlando, Las Vegas, and Los Angeles. These routes don’t have enough traffic to support daily big-airline flights, but Allegiant finds that much of the leisure market is quite happy with two or three nonstops a week. But I have a big problem with the way Allegiant presents its fares. You can’t buy a ticket online without paying a supposedly “optional” convenience fee. The only way to avoid the fee is to schlep to your local airport and buy it at an Allegiant counter after a flight has just departed (while the desk is staffed but not busy checking people in). And, because Allegiant knows that most people would find the time and cost of schlepping to an airport much higher than the fee, it knows that almost everybody will pay. To me, calling that fee “optional” is a scam. Still, taking the bad with the good, the residents of central Illinois will probably welcome Allegiant. Have you flown Allegiant? What was good and what was bad about the experience?